Ok, I am in a crisis here and I need to do my best to rebuild the filesystem. I will list every step that has been taken and mistakes made along the way, as well as the current state of the drive. Thankfully, the first thing I did was run Testdisk before these mistakes, so perhaps the .log file can be of help now. I attached a 3TB drive, formatted as a single partition HFS+ drive using a USB 2.0 disk cradle and noticed that only about 750GB were being recognized on the drive. Not thinking that it could be the cradle itself (which that was the problem) I then (from within windows) reformatted the drive as ExFAT but the problem of less disk space remained. Now I figured out the problem and attached the drive to a USB 3.0 enclosure and the 3TB was now showing properly. I am very angry to make this mistake because some essential work files are on this drive. Immediately I ran Testdisk from within the mac and I have a log file to assist if it can help. I only mention DiskDrill to give proof that the folder structure was being recognized when I scanned for HFS+. Next I did a big mistake. The drive was not mounted and was in fact not mountable, however, Testdisk and DiskDrill could read it fine. Hoping to fix the issue on a mounted drive, I then did a quick format to HFS+ on the drive, understanding that only the partition table would be re-written. At this point I was not able to see the files as before in DiskDrill (only through a deep scan which then found many orphaned files) and I was panicking. I calmed down and opened Testdisk and having read Cristophe's guide I opted to use the backup superblock to overwrite the current. Now when I run Testdisk (with 3TB disk unmounted) I can see that a quick search can find EFI system and Mac HFS. I am hoping that the superblock will give me a chance to rebuild my proper file structure. I have both TestDisk and DiskDrill log files that were generated before my mistake. I am not able to see the complete folder structure as before in DiskDrill, but a deep scan can recover 2.6TB (the full used space) but the files are sorted by type with many orphans and so I am keeping hope that because the drive is healthy and only the partition table damaged I can make full recovery. 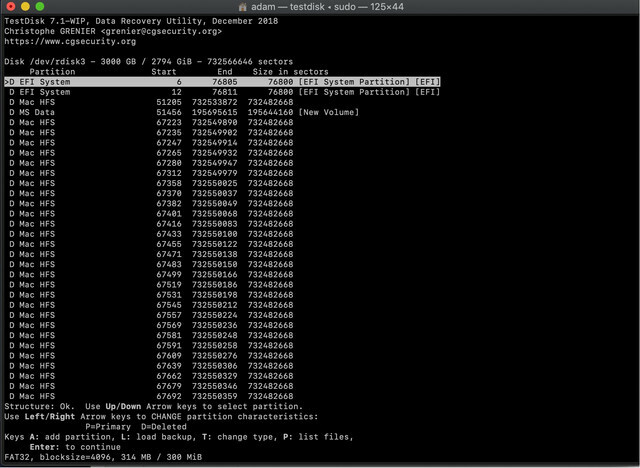 At this stage (partition reformated as exFAT and next as HFS+), TestDisk will not be able to recover the original HFS+. 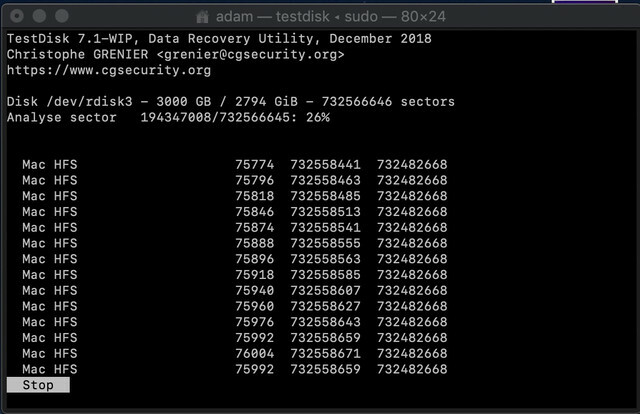 It's possible to sort the files recovered by PhotoRec (see the dedicated chapter in https://www.cgsecurity.org/testdisk.pdf) but original filenames won't be recovered. Hi Cristophe, thank you for your quick reply. I believe that I am incorrect, the drive was not formatted as ExFAT. It may have been formatted as NTFS or I may have only formatted it as HFS+ on the Mac. I have two computers: a PC and a Mac. I noticed the incorrect disk size when I had attached the drive to the PC and afterwards worked from the Mac only. Here is what I know: once attached to the Mac, the file recovery software Disk Drill was able to see my entire 100% folder structure (I checked it for accuracy) when I ran "scan for lost HFS+ partition". Therefore it seems this would not have been possible if I had accidentally formatted as ExFAT on WIndows, so there I think I am lucky. Once on the Mac I would only have formatted as HFS+ - a quick search with Testdisk at that time was able to see the correct HFS partition. I am currently running a deeper search and will post here what it finds (so far it is listing about 8 Mac HFS formatted partitions). If I attach my testdisk.log file would you consider to take a look? This data is important and I have hope for a full recovery still. The testdisk.log file was taken before I made the mistake of formatting to HFS+ (when I could still see the complete folder structure from within Disk Drill). I am hoping that if we can create a new partition with the correct cylinder value and start and end values I can be back up and running. Again, I do not believe that I formatted as ExFAT. Deeper search is currently running (at 26%) - in other posts I see that you have advised others to select "Stop" once some partitions are found. I have attached my screen and will try to attach my log file. I have provided some additional information, could I please have some help to advise the next step?